Create amazing videos, give awesome presentations! 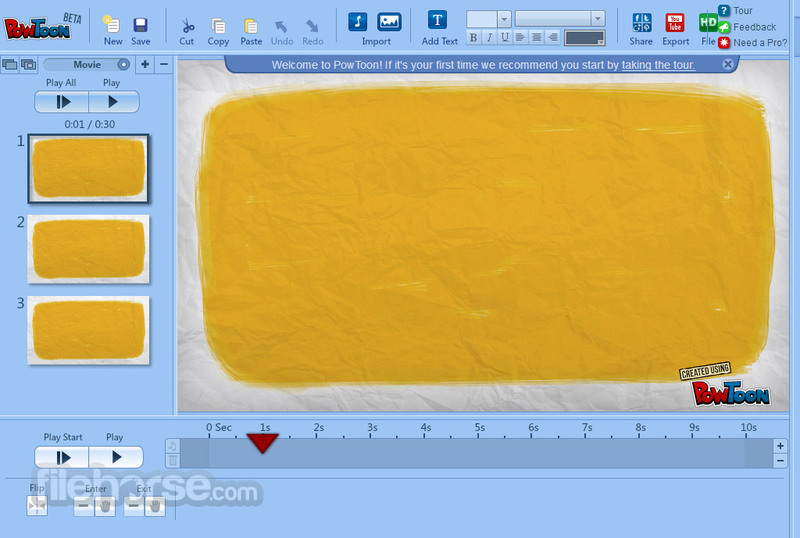 PowToon is one of the most innovative and useful presentation editing web services that have appeared on the internet in 2012. By delivering easy DIY solution for making professional-grade marketing videos, company demos, social media clips, presentations and explainers, PoweToon has captured minds of countless people and helped them to be more productive and creative. PowToon is extremely user-friendly, has an intuitive drag & drop interface, countless styles, effects, template images, and all the tools that will enable you to create professional looking presentation that will leave powerful impact on everyone. 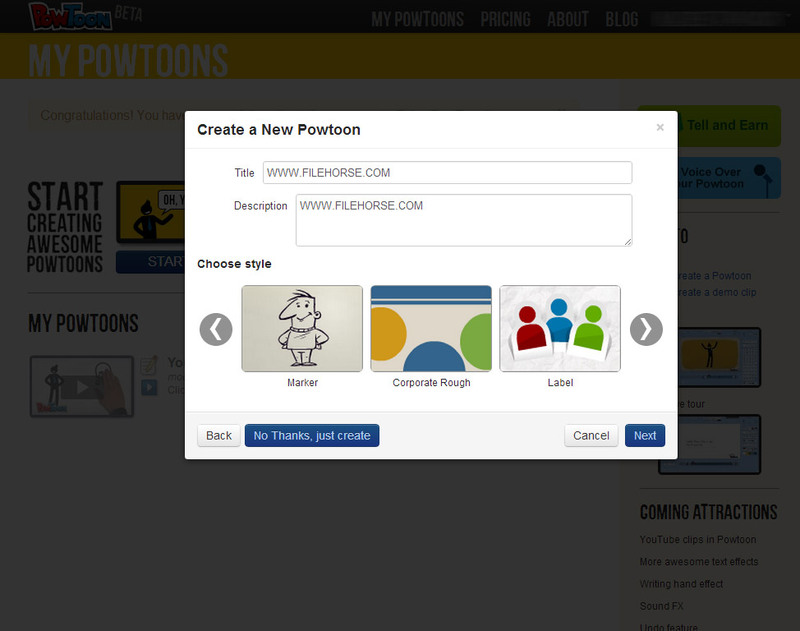 PowToon can be used for free in 14 day VIP trial period. Create amazing videos, give awesome presentations! After decades of static tools in the world of professional presentations, advent of internet finally managed to introduce several significant changes. Users finally got the chance not only to access editing suites directly from their browsers which enable them to be much more mobile and take their work together with them, but also access several totally new ways of creating presentations. Introducing animation is one of those new processes, which is exactly what developers form Powtoon aimed to provide to international audience. Create Presentation Video! Created in early 2012 and released to the public during summer of that year, Powtoon immediately managed to attract large user base which has used this app at home, school and work to create over 2.6 million animated presentations. Powtoon is a popular web company that has managed to attract a lot attention from worldwide public by offering everyone comprehensive set of tools for creation of animated videos and presentations that can easily distinguish your tutorial, eLearning session, product demos, social clips, marketing presentations and many more. To enable users to easily take full advantage from their presentation editing software, developers from Powtoon team managed to craft very intuitive interface that can be easily controlled even by users who have very little technical knowledge with similar apps. More importantly, Powtoon is perfect for users who don’t have experience with design and animation, which is a key component for this editor that is fully focused for creating animated content. Even though this web application was released to the public quite recently in summer of 2012, it immediately managed to attract not only large user base which was hungry for new generation of presentation tools, but also highly favorable reviews from internet media. The most notable praise that this app received from everyone is not only because of easy creation tools that this app offers but also good social services that give every user ability to easily share their creations not only via social networks, email, or content embedding, but also streamlined export of animations directly to YouTube. 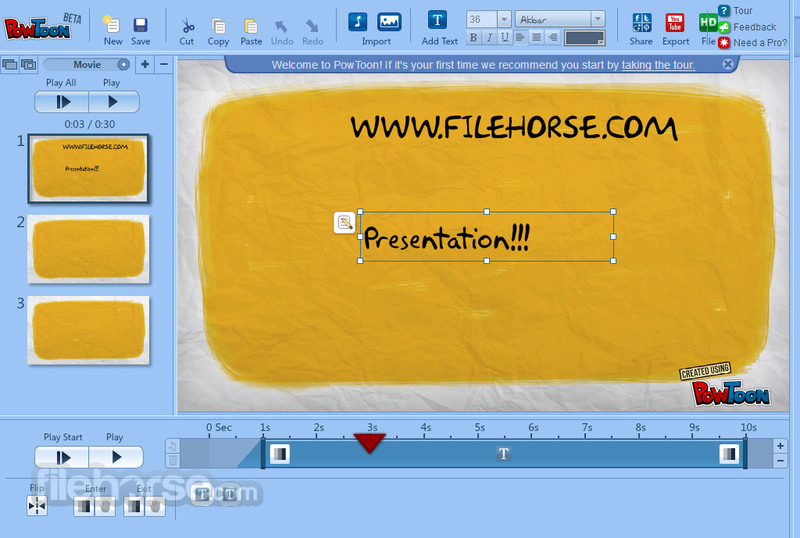 With both free and premium version, Powtoon Create Presentation Video! easily cover the needs of both novices and professionals who want to make their presentations much more eye-catching, appealing and able to provide new way for information sharing in professional environment. Because Powtoon is so oriented to animation and not many people have knowledge (and time) to learn how to perfectly control them, developers of this app spent a lot of time creating interface that could be easy to use and powerful no matter how knowledgeable users is. This can be noticed as soon as you start managing editing app, which thankfully also holds easy access to lots of tutorials that describe every function of this powerful app. Free version of Powton gives user access to almost all features of this app, but with many services limited in their use (up to 5 min videos, SD quality only, smaller music library, animation styles, branding and more). These limitations are removed with use of two premium tiers, “Pro” that costs $19/month and “Agency” for $57/month that even unlocks monetization rights. Powton is a perfect webapp for everyone who wants to create animated presentations that can be used both for personal sharing and for professional uses. 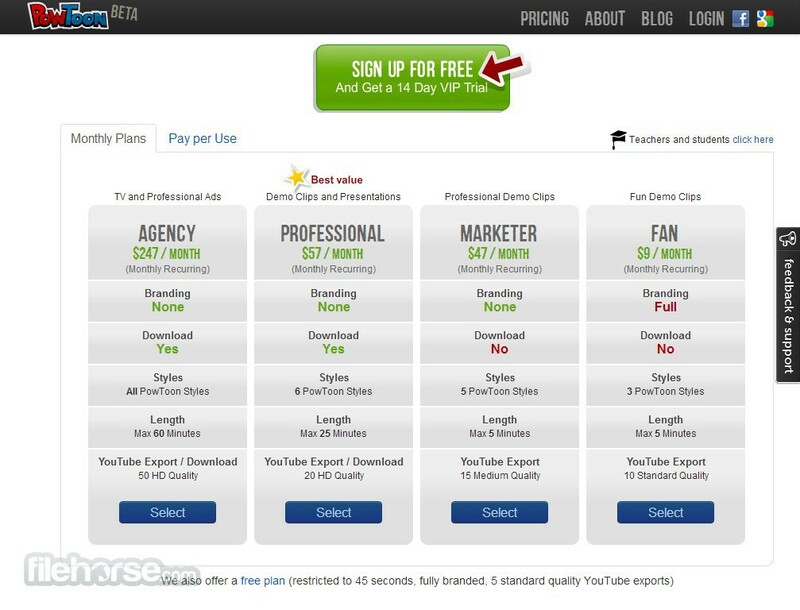 Service is easy to use, encourages experimentation and has great social sharing tools. Create Presentation Video today!